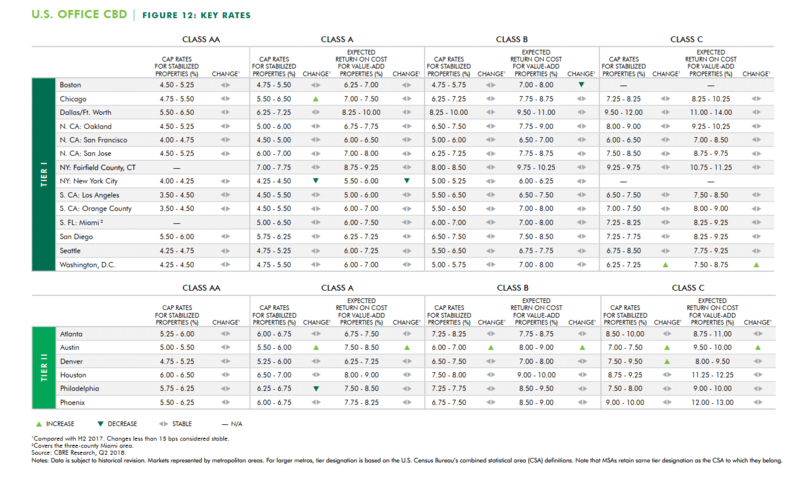 In my recent articles on Manulife and Keppel KBS, I highlighted a potential tax complication that could have an adverse impact on both REIT’s dividend yield. 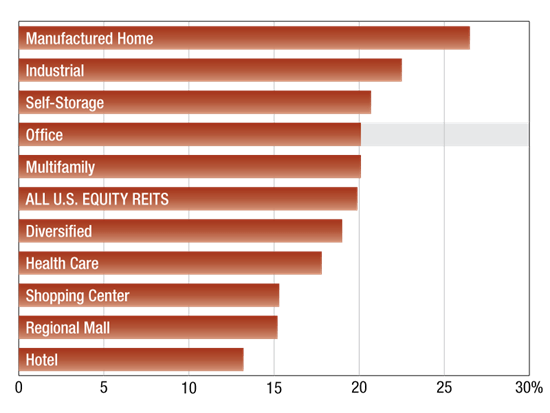 Both REITs own office properties in United States and have set up certain corporate structure to optimize the taxes that they have to pay. However, in Dec 2017, there was a big change in the United States tax code. The Tax Cuts and Jobs Act (TCJA), was one of the biggest change to the tax code since 1986. 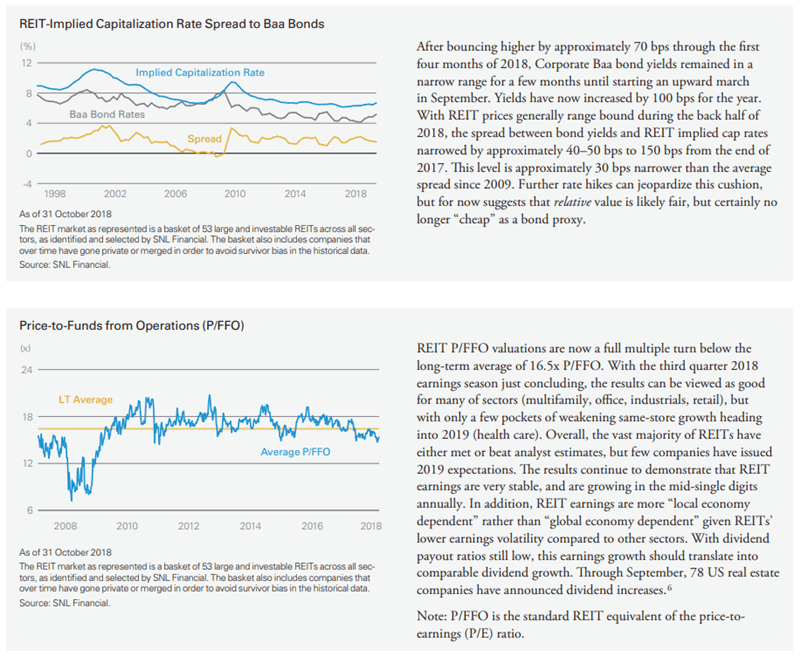 To address section 163(J), both REITs restructured their United States property ownership structure to be flat, thus eliminating the impact of interest deduction limit. 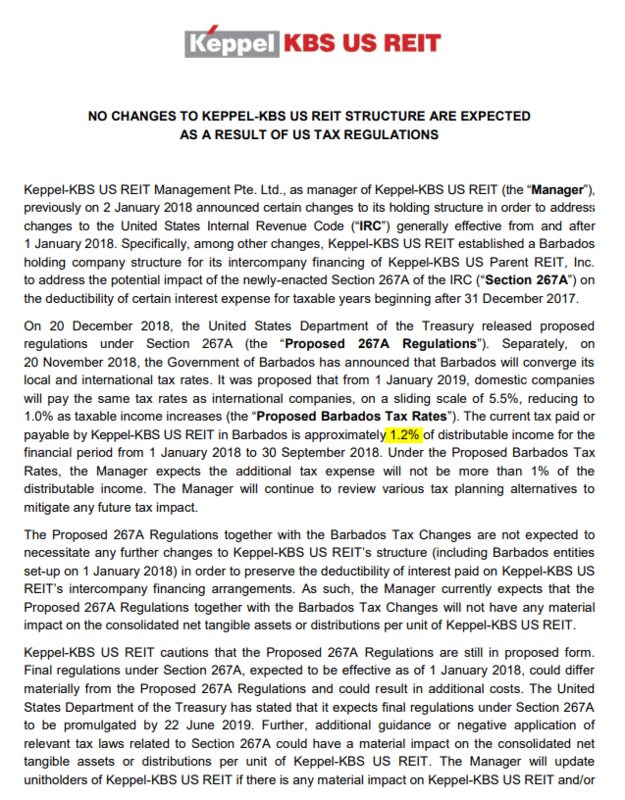 To address section 267A on the tax deductibility of interest expenses on the United States entity, both REITs restructured to have an intermediate Barbados entity. 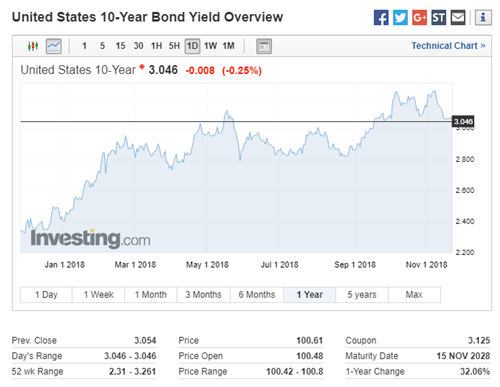 As long as the income received by the Barbados entity is taxed, the United States entity can use the interest expense as a tax shield, reducing the tax payable and preserving the dividend. These changes to the tax code can be rather ambiguous to those trying to file taxes. Thus, the IRS will come up with tax clarifications to guide what is allowed and not allowed. 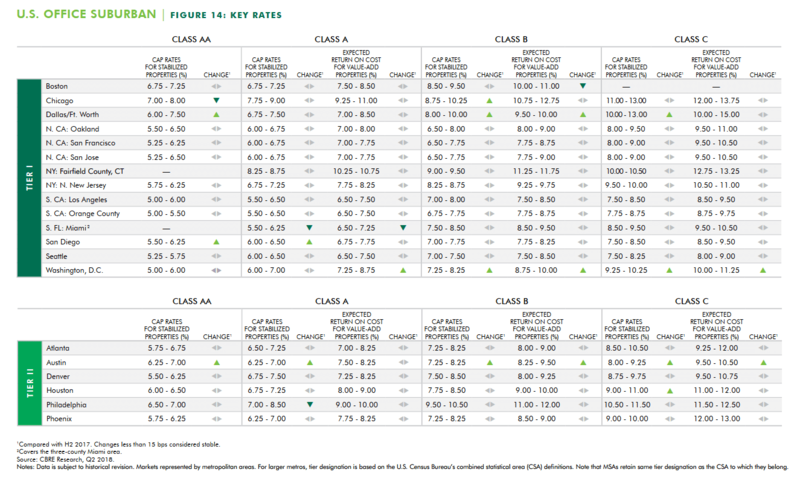 Manulife and Keppel KBS have warned that the clarifications to section 267A could potentially have adverse material impact in terms of reduction but reduction of dividend. On 20th Dec 2018, , IRS have submitted their tax clarification proposal related to section 267A. This proposal is currently in unpublished status but will likely be published tomorrow. Since this announcement should be released soon, I tried to keep in touch with it. I read through those two documents. I looked through the different examples of what constitute a CFC, what would consider a hybrid entity or hybrid transaction. I looked at the examples given. 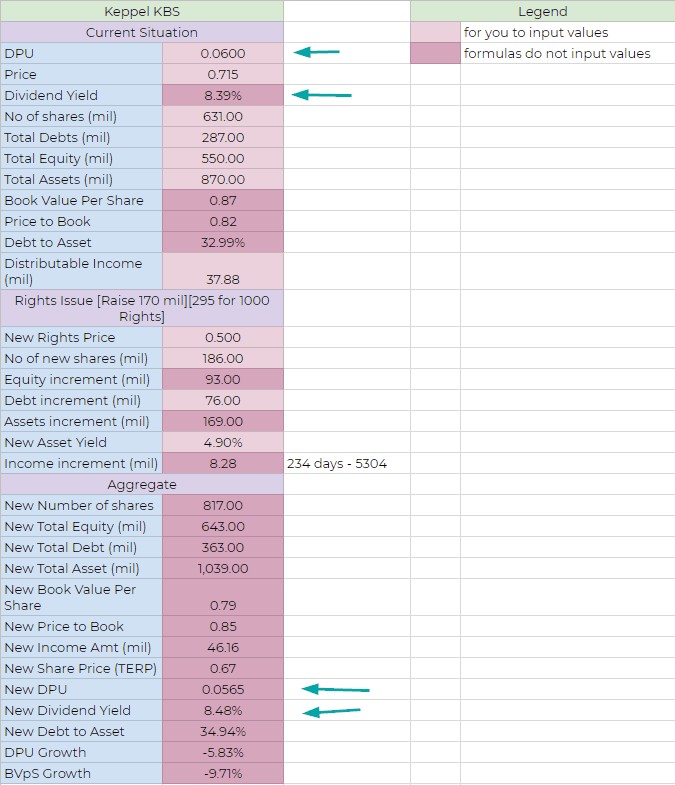 My conclusion is that the scenarios painted, that would make these 2 REITs be deemed as a hybrid entity, would not make them look like a hybrid entity. 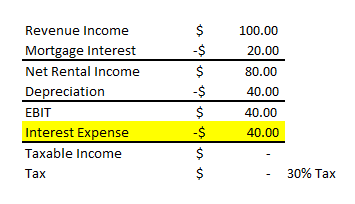 And thus, both REITs should be able to use interest expense as a tax shield. The impact to their dividends should be limited. In my research on these tax issues, I realize that the international government is coming down hard on some of these tax havens that provide preferential tax rates. Some of the common ones are countries like Barbados. Basically, Barbados have 2 different taxes. 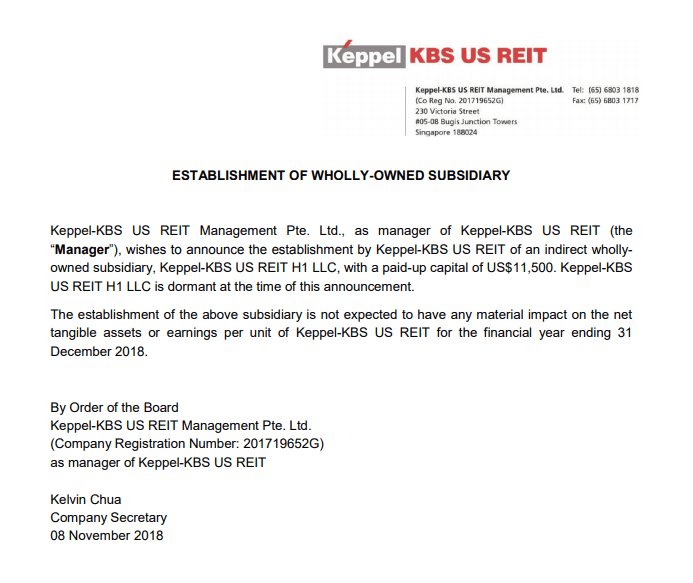 One for the domestic folks (30% corporate tax) and one for the international regimes (0.5% to 2.5%, this is the one Keppel KBS and Manulife restructured to). 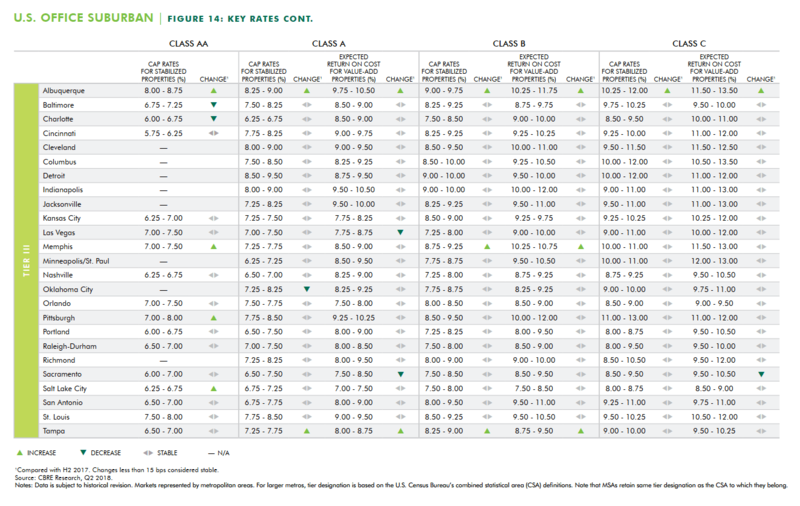 So you can see why the OECD is not very happy. It should be noted that the US tax office somewhat take reference to the OECD’s BEPS guidelines, published in 2015. Thus, if Barbados bring themselves in compliance with OECD guidelines, then it should be OK with the US Tax code. The government of Barbados announced that they will be in compliance with OECD by end of the year. Barbados decided to reduced their domestic corporate tax to that of their international corporate tax. Essentially now, there is one set of corporate tax structure only. It should not be hard to guess that the international business far outweigh that of their domestic, so they have to swallow this bitter pill. 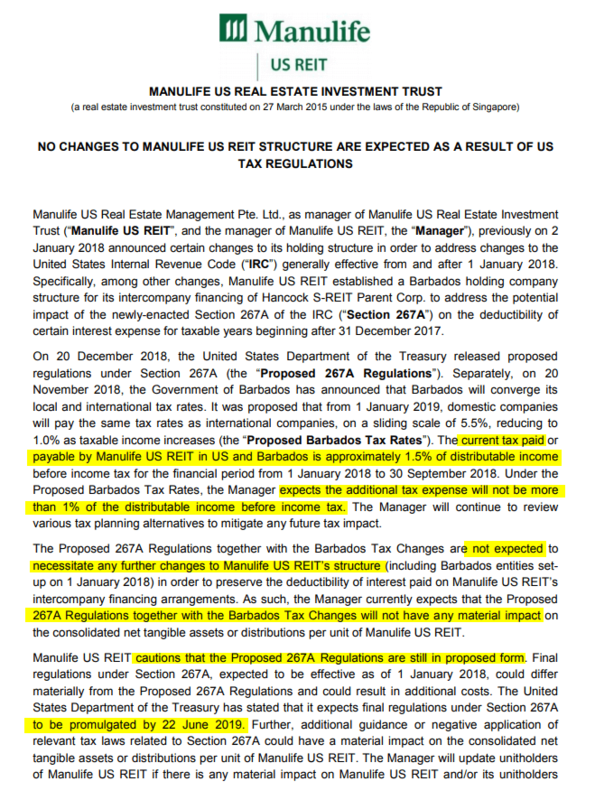 We will eventually know that Manulife’s tax will increase from 1.5% to 2.5% as a result of this change in the Barbados tax system (see below). 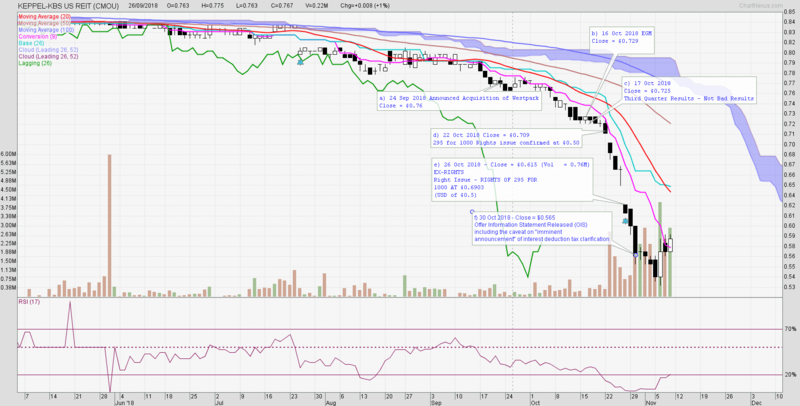 This morning both Reits made individual announcements through SGX regarding tax clarifications. Management highlighted that there should be an additional tax expense of no more than 1% of distributable income before income tax, due to the change in Barbados Tax Rates. There should not be any increase in costs, to restructure the corporate structure to optimize taxes. They end off with a disclaimer that the release is in proposed form and the finalized report should be ready by 22nd Jun 2019. If there are changes, then there might be material impact. 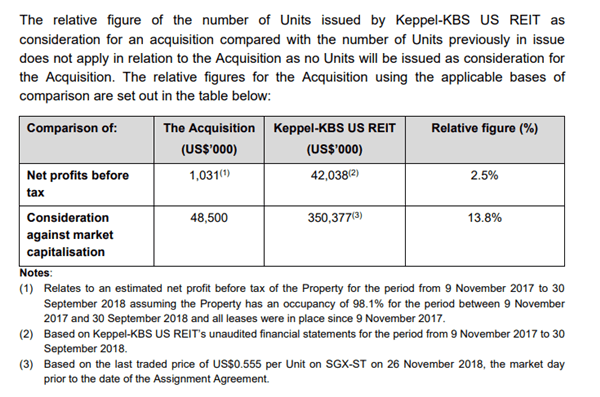 You do realize just how similar Keppel KBS’s announcement is. 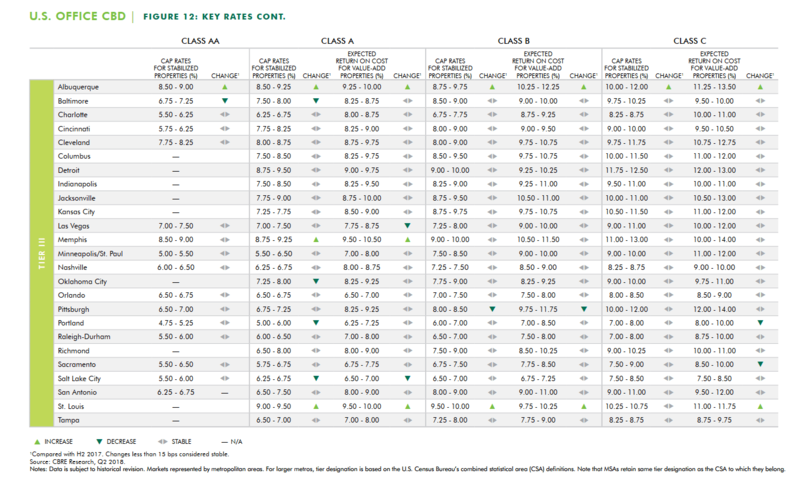 It is as if they just replaced Manulife with Keppel-KBS, and change the 1.5% current tax paid to 1.2%. 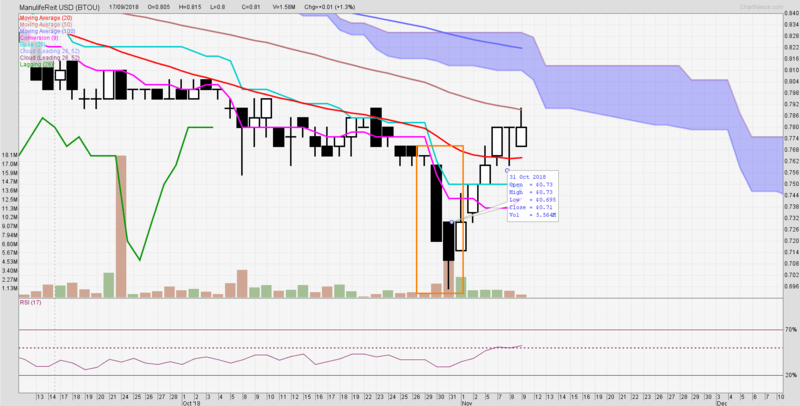 I honestly do not believe 2 companies can timed their release so close together. When I got wind of this proposal, it was 5 days ago, 2 days after the proposal was published. It is not as if the proposal was published yesterday night. What are the Risk of Drastic Changes in the Finalized Regulation? One question that is on my mind was that, given the disclaimer at the end, it does raised the possibility that there may be drastic push back or amendments to line items in the proposal. 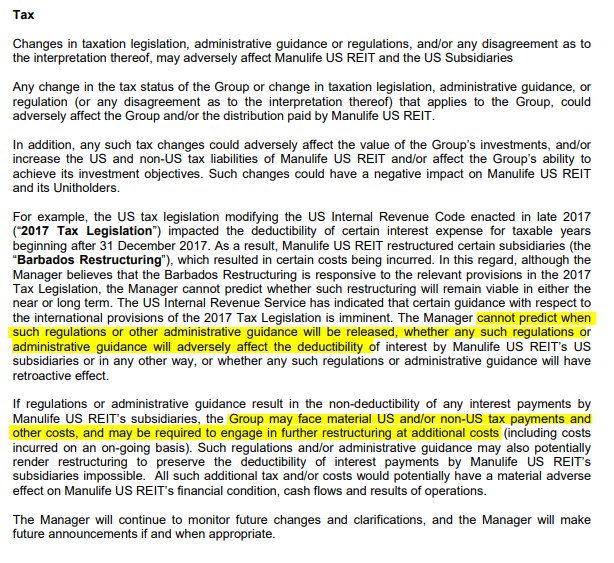 In an analyst report published yesterday by Deutsche Bank, Manulife US REIT notes that IRS initial proposals tend to be more conservative, with final regulations having the potential to be more lenient as additional clarifications and guidance be issued. So likely, based on their experience with the IRS, they do not see a lot of drastic changes that would result in material impact. 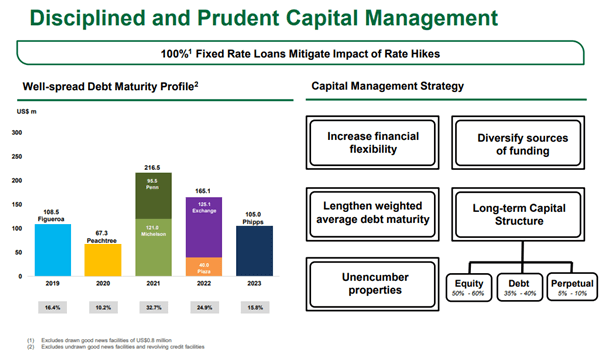 In the same report, management also believes that they will be able to mitigate most if not all of the impact via depreciation shields and restructuring of holding companies. 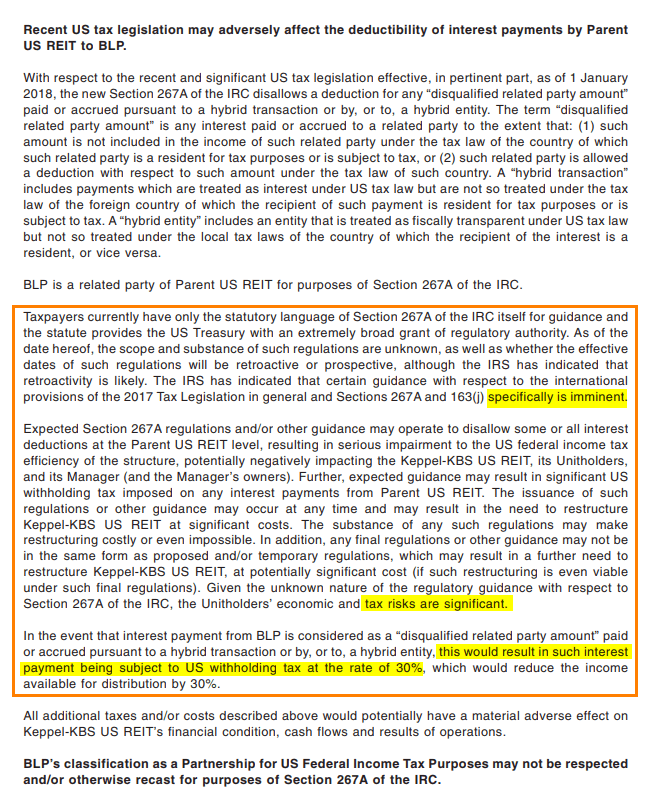 What is of note is that, perhaps after the finalized regulation is out by 22nd June 2019, the management can “move more aggressively in tax planning”, “potentially reverting to a structure where it enjoys nearly full tax transparency“. My England is not so powerful, but by reverting it does mean a reversal to a structure previously. 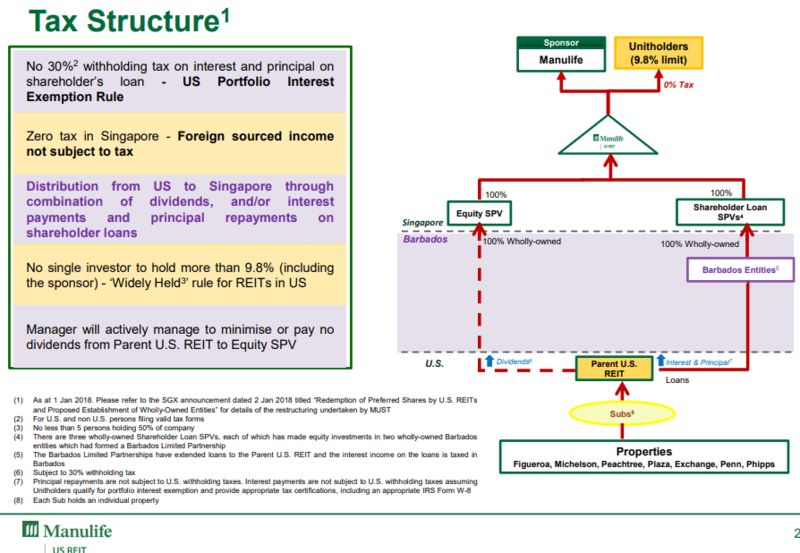 If I understand correctly, under the previous structure, it will entail the income paid to the Singapore parent to be a hybrid transaction. 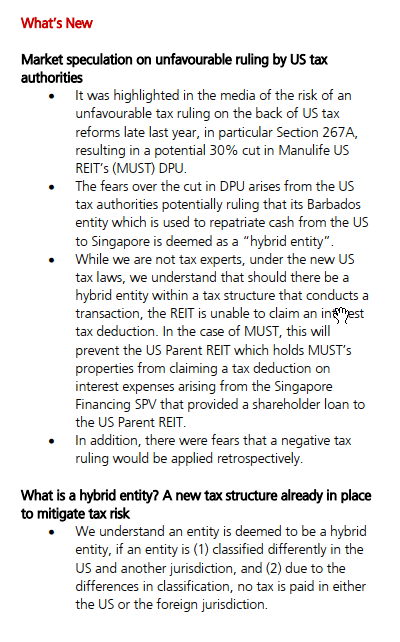 Yet, this reversion would potentially make them enjoy full tax transparency, which means we might go one big round and end up back to square one, without the Barbados entity. However, the Reit is now in a tax planning phase, said Mr Obhan. 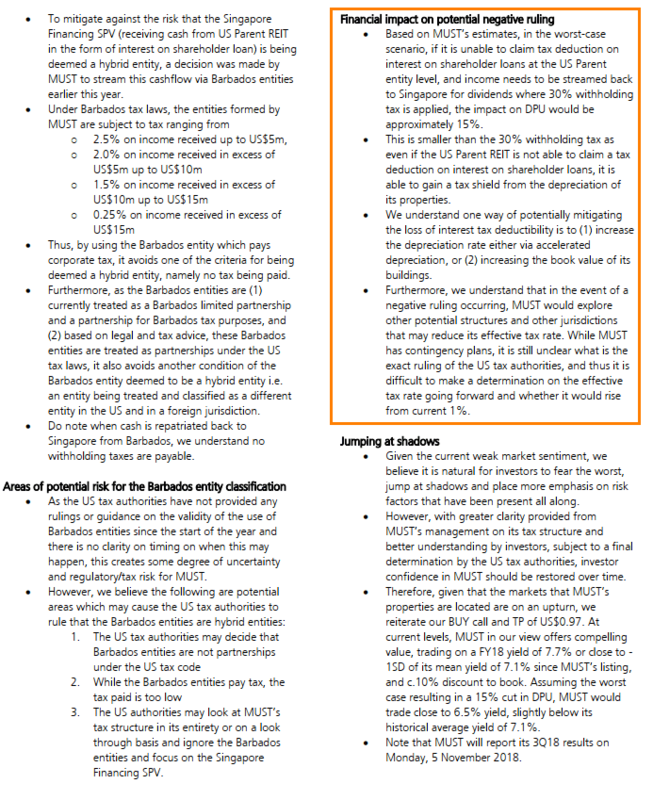 He added: “We do have multiple levers that we can pull to mitigate most of that one per cent impact that we have put as a worst-case scenario.” These alternatives include merging the current three different layers of entities in Barbados, as a higher total income will enable them to enter the lowest one per cent tax bracket. 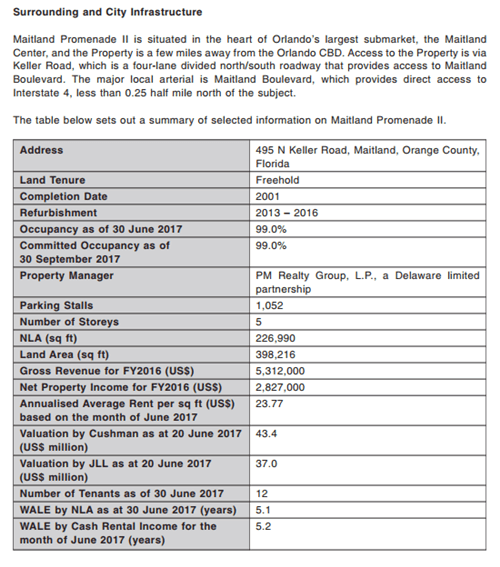 He also acknowledged the possibility of reverting to the Reit’s original structure in which the Barbados entities do not feature. 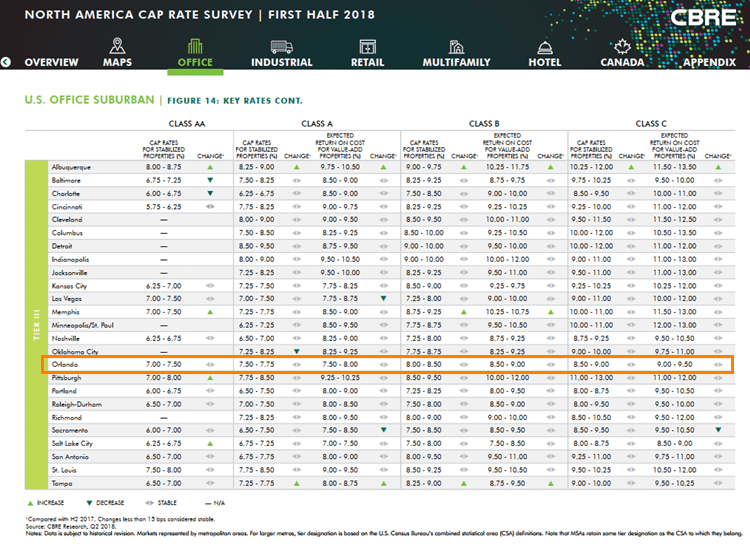 In sum, the worst-case scenario for the effective tax rate faced by the Reit in 2019 would be “slightly above one per cent”, with the best-case scenario being a zero per cent tax rate, he added. 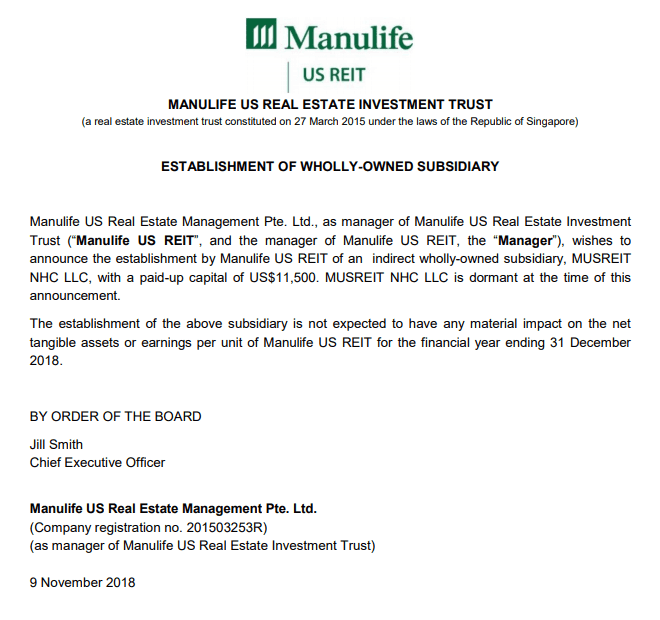 Manulife US REIT ended the day at $0.745 and Keppel KBS at $0.57. 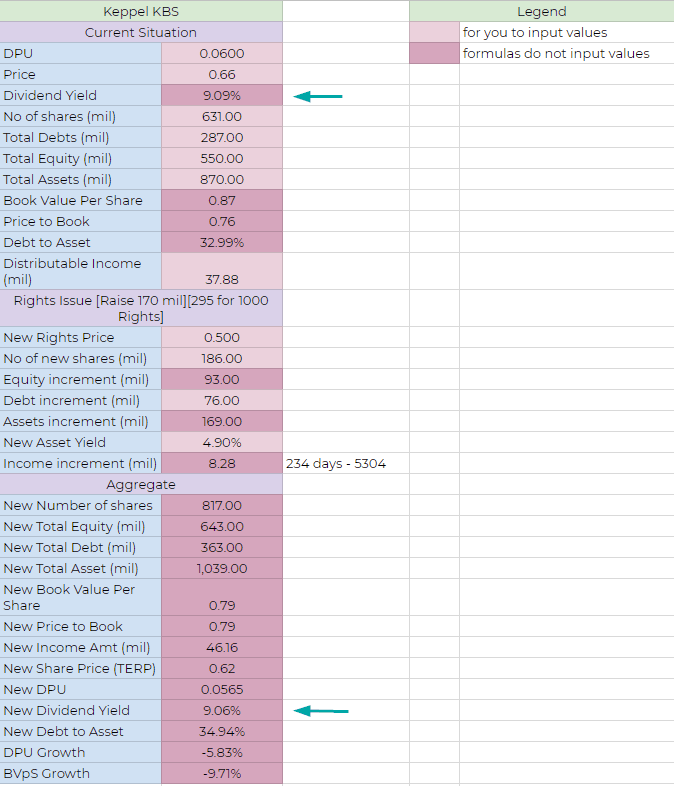 One provides a dividend yield of 8% the other nearly 10%. 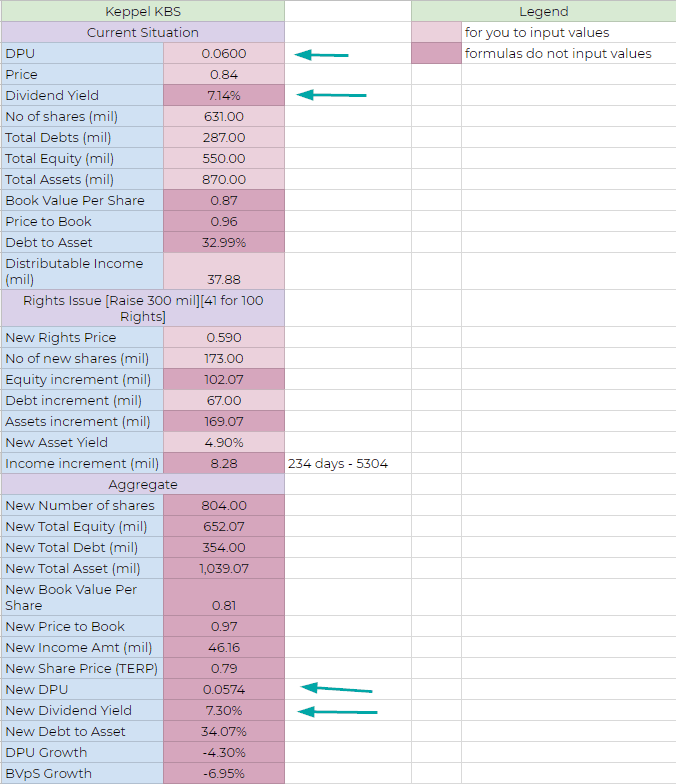 This increases the risk adjusted returns of these two REITs. One last question that may be on your mind is, how much is the uncertainty that the tax code would gyrate again. If we look to history, the last major change in tax code was in 1986, after much pressure. This tax code change in 2017 was the one after that, and that happened 31 years after the last one.